NSA and PRISM top of mind. (SNN) - This week, although President Obama was in Africa he kept a keen eye on the developments in Egypt. Mr. Obama was concerned that the fledgling democracy in Egypt might be in trouble since Egypt’s president Morsi was elected just a year ago. Mr. Obama called Mr. Morsi on the telephone. They spoke about democracy and thanks to the NSA and the PRISM program, we have a complete transcript of the short conversation. M: Hello, I hope, big brother, you called to offer your support to me and the entire country of Egypt. O: Little Bro, you know I would love to do anything for you, but I am in a predicament. I want to support you, but democracy is about more than elections; it is about listening to the voices of your people. M: Brother, I have tried to listen to the voices. How do you listen to the voices of all those people in America? It must take forever. O: I have an entire agency devoted to listening to people. It is called the NSA and they listen in on everything- phone calls, emails, text messages, even twitter. M: Umm, what does this have to do with me? O: Well, nothing actually. I just called to wish you the best. And remember, if the army takes over and kicks you out, it isn’t a coup, just be cool. Remember, not a coup, just cool. Photo by: DonkeyHotey flickr photostream, Some Rights Reserved, The Sage nor this article endorsed. 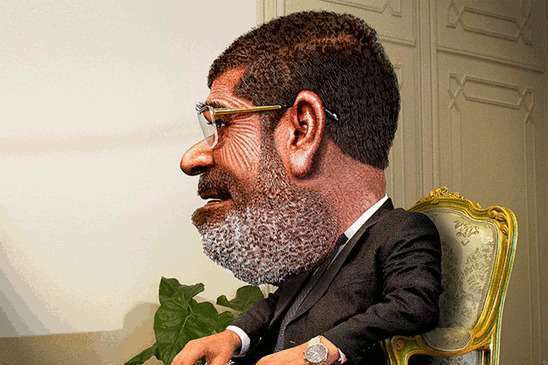 "The Guardian: Mohamed Morsi's power grab is an odd way to build a democracy"